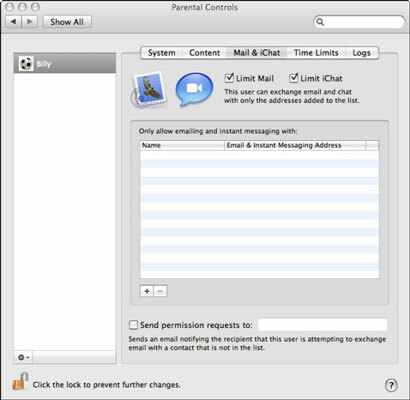 When you set up parental controls for your child’s Mac, you need to choose the options you want enabled in the various Parental Controls pane. Of course, you’ll want to set the System and Content panes, but you may want to set parental controls in the following panes: Mial & iChat, Time Limits, and Log. The Mail & iChat pane: Your kids will quickly discover that the Mac is a great communication tool. The Mail & iChat pane lets you decide to whom they can talk via e-mail or instant messaging (IM). Note that the controls here only apply to Apple’s Mail and iChat. If your kids can download another mail or IM program, such as AOL’s AIM, these parental controls do not apply. Some mail programs, such as Yahoo! Mail and Gmail, require only a Web browser. So, if you want your “white list” restrictions enforced, you must also limit the programs your children can download and block access to e-mail sites. This pane also lets you specify an e-mail address — yours presumably — where notifications are sent when someone not on the white list attempts to contact your kid in Mail or iChat. The Time Limits pane: Other programs for limiting kids’ use are often too complex for parents to understand, much less set up and explain to their kids. This one is easy. You have two types of control. One limits the amount of time a child can use the computer each day. The other blocks any usage after bedtime. And you find two sets of controls for each limit: one for weekdays and the other for the weekends. It’s simple, and it works. The Logs pane: OS X keeps track of what your kids are up to online. You can see the logs by periodically visiting this pane. You can choose to see logged activity for Web sites your child visited, Web sites he attempted to visit but where access was blocked, applications he used, and iChat conversations he engaged in.